St. Paul, Minnesota, September 11, 2013 – PolyMet Mining Corp. (TSX: POM; NYSE MKT: PLM) (PolyMet or the Company) has filed its financial results for the three months ended July 31, 2013. The financial statements have been posted on our website at www.polymetmining.com and on SEDAR and EDGAR and have been prepared in accordance with International Financial Reporting Standards (“IFRS”). All amounts are in U.S. funds. Copies can be obtained free of charge by contacting the Corporate Secretary at First Canadian Place, 100 King Street West, Suite 5700, Toronto, Ontario M5X 1C7 or by e-mail at info@polymetmining.com. Loss for the three months ended July 31, 2013 was $1.762 million compared with $1.982 million for the prior year period. General and administrative expenses in the three months ending July 31, 2013 were $1.283 million compared with $0.837 million in the prior year period, excluding non-cash share based compensation. The increase primarily reflects increased costs indirectly related to the successful $60.5 million rights offering completed during the period. Loss for the six months ended July 31, 2013 was $3.422 million compared with $3.232 million for the prior year period. General and administrative expenses in the six months ending July 31, 2013 were $2.406 million compared with $1.504 million in the prior year period, excluding non-cash share based compensation. The increase primarily reflects increased costs indirectly related to the successful $60.5 million rights offering completed during the period. At July 31, 2013 PolyMet had cash and cash equivalents of $48.778 million compared with $8.088 million at January 31, 2013. The increase in cash reflects the net proceeds from the $60.5 million rights offering. The $20 million bridge loan received in the first three months of the current year was repaid with proceeds from the rights offering. 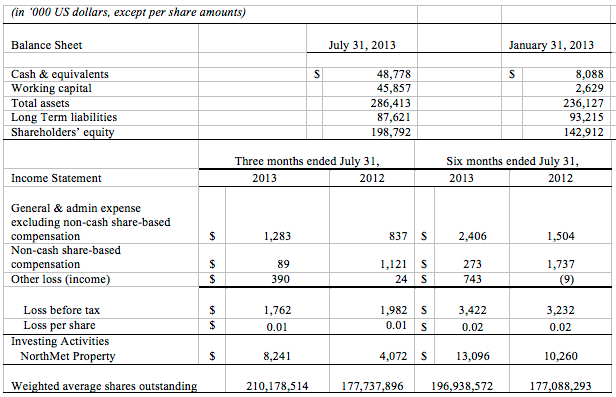 Convertible and long term debt at July 31, 2013 was $34.350 million. PolyMet invested $8.241 million into its NorthMet Project during the three months ended July 31, 2013, compared with $4.072 million in the prior year period. The increase reflects land purchases as well as increased activity leading to completion of the supplemental draft Environmental Impact Statement, scheduled for publication in late November 2013. PolyMet invested $13.096 million into its NorthMet Project during the six months ended July 31, 2013, compared with $8.168 million in the prior year period, excluding a $2.092 million purchase of wetland restoration properties in the prior year period. As of July 31, 2013 PolyMet had spent $61.336 million on environmental review and permitting, of which $54.885 million has been spent since the NorthMet Project moved from exploration to development stage on October 31, 2006, following publication of the Definitive Feasibility Study. This news release contains certain forward-looking statements concerning anticipated developments in PolyMet’s operations in the future. Forward-looking statements are frequently, but not always, identified by words such asexpects, anticipates, believes, intends, estimates, potential, possible, projects, plans, and similar expressions, or statements that events, conditions or results will, may, could, or should occur or be achieved or their negatives or other comparable words. These forward-looking statements may include statements regarding our beliefs related to the closing of the Rights Offering, the ability to receive environmental and operating permits, job creation, or other statements that are not a statement of fact. Forward-looking statements address future events and conditions and therefore involve inherent known and unknown risks and uncertainties. Actual results may differ materially from those in the forward-looking statements due to risks facing PolyMet or due to actual facts differing from the assumptions underlying its predictions. Specific reference is made to PolyMet’s most recentAnnual Report on Form 20-F for the fiscal year ended January 31, 2013 and in our other filings with Canadian securities authorities and the U.S. Securities and Exchange Commission, including our Report on Form 6-K providing information with respect to our operations for the three months ended April 30, 2013for a discussion of some of the risk factors and other considerations underlying forward-looking statements. PolyMet has filed a registration statement (including a prospectus) with the U.S. Securities and Exchange Commission, for the offering to which this communication relates. Before investing, prospective investors should read the prospectus in that registration statement and other documents the issuer has filed with the U.S. Securities and Exchange Commission, for more complete information about PolyMet and this offering. The documents are available free of charge by visiting EDGAR on the U.S. Securities and Exchange Commission website at www.sec.gov. Alternatively, PolyMet will arrange to send you the prospectus if you request it by calling1-416 915-4149.